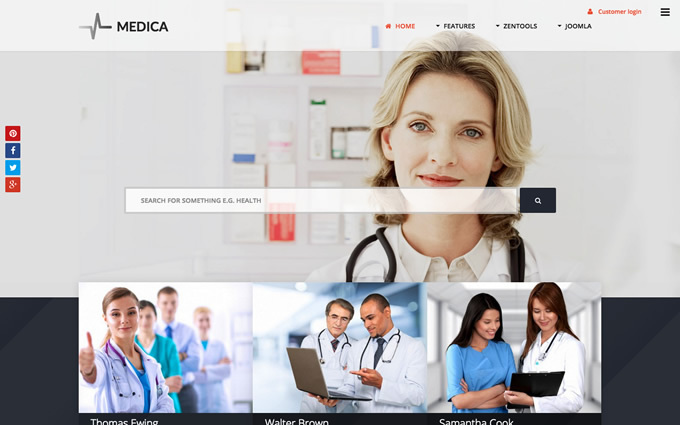 Medica is a crisp, clean and corporate responsive Joomla template built with a medical / health care services business or organisation in mind. It's a flexible design with an array of features and functions for you to create your next Joomla website with. Gazetta provides the option for you to specify the spacing and colours used across the design. You can set the general module padding, mainconnent padding, sidebar padding, sidebar background, date colours, menu color and more. Medica is built on the Zen Grid Framework v4 which features a flexible layotu structure which means you can create single, two, three column layouts and order the columns in any way you like. Medica features full Bootstrap2 and Bootstrap3 support. It doesn't require Bootstrap for any of it's display elements however if you are using a 3rd party extension that uses either Bootstrap2 or Bootstrap 3 you simply compile that into your theme. Medica features full access to the extensive Google Font library as well as the ability to patch in any of your Typekit font kits. The Zen Grid Framework v4 gives you an array of choices when it comes to choosing how you display your site navigation to users on small devices. Choose from toogle, offcanvas, select and stacked menu options. Easily add fades, roation, slides and bounces to entire rows of content or specific items (when displaying content using Zentools2), to give your site that extra animated feel. Medica features a stellar collection of usability tools and tweaks that help to enhance your site's user experience. Medica features a selection of socialbuttons that are built into the template using Facebook like, Twitter tweet, Google Plus one and Pinterest pinit share technology. You can also add your own social network icons via the template admin. Our framework is an open and flexible templating framework that provides an easy to follow layout structure and hierarchy with a lot of tools such as script and css compression out of the box via the template settings. One page websites are big news in 2015 and Gazetta features the ability to transform the main menu into a menu consisting of links to various rows on the page.